Resistance bands are very useful tools, which are sometimes overlooked during strength training. Typically, most people love to grab the heavy barbells and dumbbells, but it’s important to remember that resistance bands are great to keep in your training toolbox. Bands also come in handy while traveling. Here are 15 resistance band exercises covering all muscle groups using only bands. Check out the video for a visual demonstration. Grab a light band, hands about shoulder-width apart. Raise your arms up straight in front of you and pull the band apart, pinching your shoulder blades together and opening your chest up. Keep your arms straight the entire time; if you have trouble keeping them straight, try a lighter band. Loop a band around a pole and sit on the ground; the band should be at chest level. Scoot back until your arms are straight out in front of you with a little tension on the band. Keeping upright posture, row the band back to your chest and pinch your shoulder blades together. Loop a band around a pole at eye level. Grab the band, take a step back, arms out straight ahead, with tension on the band. Keeping the backs of your hands pointed to the sky and your elbows up, pull the band back to eye level. If you are doing this correctly, you will really feel the burn in your upper traps. Loop a light band around a pole at chest level. Step out parallel to the pole and grab the band. Press the band straight out and take a small step back. Keeping the band pressed out, take two or three lateral steps away from the pole. Keep your arms pointed straight ahead and avoid turning back toward the pole. Return to the starting position in reverse..
Set up the same as for Pallof Walkouts and take one to two steps laterally. Press the band out from your chest so your arms are fully extended. Slowly draw circles in the air with your hands. Avoid turning in toward the pole. Set up the same as for Standing Stir the Pot, press the band out, but this time rotate your body in toward the pole. Keep your arms at the same height the whole time. Once your hands are pointing toward the pole, explosively rotate back the other way until your hands point in the opposite direction. Control the band on the way back to the starting position. Wrap the band around a pole close to the ground, sit on the ground, and hook the band around your toes on both feet. Scoot back so the band has a little tension and lie back on the ground. Flex your hips by bringing your knees to your chest. Set up the same as for Supine Hip Flexion, but get into a push-up position and hook the band around only one foot. Flex your hip and drive your knee toward your chest as hard as possible against the band. Grab a light band and drape it across your back on your shoulder blades. Wrap the ends of the band around your thumbs. Perform a Push-Up as you would without the band. 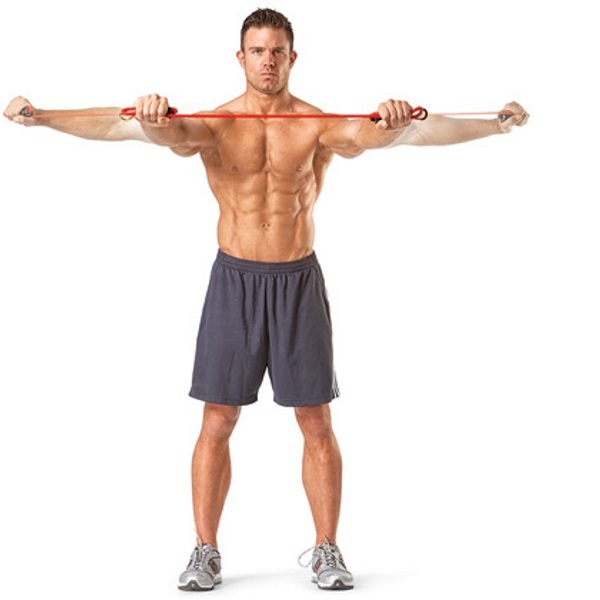 Hook the band around a pull-up bar and grab it with your elbows bent and tight to your sides. Extend at the elbows until your arms are completely straight. Perform this exercise like you would a Tricep Push-Down with a rope attachment on a cable machine. Stand with your feet shoulder-width part and hook a band under your feet. Grab grab the band with both hands and curl it up to the top, keeping your elbows tight to your sides. Control the band on the way down. Set up two bands on a squat rack at head level or slightly higher. Grab the bands, take a step forward and get into a staggered stance. Pull the bands across your chest, ending in front with your arms slightly crossed. Perform this exercise like you would a Standing Cable Fly. Hook a band around the bottom of your foot. Cross the band over itself and grab it with your hands at shoulder level; the band should form an X. Keeping your toes pointed straight ahead, step out laterally with your lead foot as far as you can, then step with your trailing foot. Repeat, alternating your lead foot. Step on a band like for X-Walks, but hook the other end around the base of your neck. Keep a slight bend in your knees and your back flat. Stop when your torso is parallel to the floor. Return to the top contracting your glutes as hard as possible at the top of the movement. Hook a band around a post about a foot off the ground and lie down on your belly. Hook the band around one heel and flex your knee, performing a Single-Leg Hamstring Curl.